The Constable/Westville/Trout River Food Pantry is in need of volunteers!! Looking to give back a little bit of time to your community? Do you need community service hours? Are you looking to get out of your home and see people every other weekend? The Food Pantry is in need of local volunteers to assist every other Saturday at the St. Francis of Assisi Church located on Poplar Street in Constable, New York. 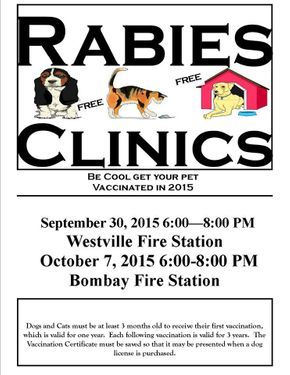 Interested individuals should contact Stan/Lori Tulip (518) 483-7675. HUD has established the 2017 INCOME GUIDELINES. Please click the link below to determine if you are eligible for our current HUD grant. WESTVILLE — The towns of Westville and Chateaugay have each been awarded $500,000 in housing grants, officials in the two towns announced Monday. The New York State Community Development Block Grants awarded through the state Office of Community Renewal’s Housing Trust Fund Corp. were awarded last week. Local officials received notification of the awards on Monday. The money will be used to finance the rehabilitation of houses in the community and to increase the opportunity for home ownership for low-income families, the supervisors for the two towns said. The CDBG program is funded by the federal Department of Housing and Urban Development and administered by state agencies. The CDBG grants are part of the OCR’s 2016 Competitive Housing Round; the agency awarded over $15 million in grants to assist communities across the state with affordable housing. Both town supervisors received news of the grant awards through a letter from James Rubin, chair of the New York State Housing Trust Fund Corp.
“Working collaboratively with our local partners, these investments will help to revitalize communities and improve the quality of life for the working families of New York by providing home ownership opportunities and better quality of living through home revitalization programs,” the letter from Rubin read. Bilow and Westville Town Supervisor Rod Lauzon both thanked Friends of the North Country for their aid in writing the grant proposal for the grants. The towns had received funding through the block grant program previously, but Lauzon noted that the total was $100,000 more than his town had received in the past. A Neighborhood Watch Meeting will be held on October 12, 2016 at 7:00 p.m. at the Westville Fire Station on State Route 37 in Westville. October 17, 2015 marks the 14th Anniversary of the death of Marie Fleury. Once again, in her memory, the Town will hold its annual Neighborhood Watch Meeting. Investigators Jason Pelkey and Donahue of the New York State Police will provide an update on this unsolved crime. Malone Chief of Police, Chris Premo, will provide the Town with updates on happenings in the area. At this meeting the local candidates running for office: Billy Jones, Paul Lauzon, Mike McDonald and Ed Andrews will be present. Please attend and support our law officers and show our appreciation for all the hard work that they do. Town of Westville Residents: The Town is considering applying for a CDBG housing rehabilitation grant. If you own your home, and your household income is less than the amount listed below (based on the number and income of all persons living in the home), and your home needs serious repairs, PLEASE CALL (518) 834-9606 Ext. 25 or toll free 1-888-355-3662 Ext. 25 BEFORE JULY 8TH, 2016 for a brief confidential interview about your housing needs to help the town’s efforts. The Town of Westville is requesting proposals from local businesses to provide mowing services for the 2016 spring/summer season in the Town of Westville, NY. A detailed request for proposal further describing the expected services and proposal submission requirements may be obtained from Ann F. Brady, Town Clerk, 936 County Route 19, Constable, New York 12926, telephone (518) 358-0026. Proposals must be received by Saturday, April 9, 2015 at 12:00 PM. The Town of Westville encourages proposals from small, minority, and female-owned businesses; and does not discriminate on the basis of handicap status. 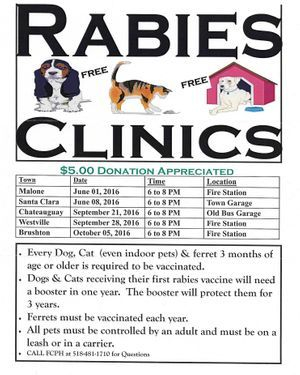 If you have any questions, please contact Ann F. Brady, Town Clerk at (518) 358-0026. WESTVILLE -- Darwin V. “Pete” Fleury, 69, of Westville, New York, passed away Sunday morning, March 13, 2016, at his home, while under the loving care of his family and Hospice of the North Country Inc.
Born in Malone, New York, Jan. 28, 1947, he was the son of the late Erwin and Dorothy Brockway Fleury. He graduated from Salmon River Central School in 1965. On June 13, 1970, he was united in marriage to the former Emily L. Thatcher in East Hartford, Connecticut. She survives. Many years ago, he was employed by Pratt & Whitney Aircraft in East Hartford, Connecticut. He later was employed by Calia Ford in West Hartford, Connecticut, as a general manager. After returning to the North Country, Darwin served as sales manager at Bailey Motor Co. in Malone from 1986 until his retirement in 2006. Pete was known throughout the area as the “Sharpest Pencil in Town” for his great deals. He also served as the Westville town justice from 1989 until his death. He was a communicant of Our Lady of Fatima Church in Westville. He was a longtime member of the Malone Lodge of Elks and held several positions. He was a member of the New York State Magistrates Association. He enjoyed fishing, camping and his two dogs, Duke and Daisy. His most memorable times were spent with his grandchildren and his camping family at Ponderosa Campground. Along with his loving wife, Emily, he is survived by one son and daughter-in-law, Dean and Angie Fleury of Westville; two daughters and a son-in-law, Melanie Fleury of Westville and Brenda and Brent Denny of Malone; one brother and two sisters-in-law, Vance and Kathy Fleury of Massena, New York, and Theresa Fleury Daigle of Westville; one sister, Jacqueline of Malone; eight grandchildren, Morgan and Ryan Shook, Dylan, Abby and Kelly Denny, Addison Fleury and Alicia and William Ives; and several nieces, nephews and cousins. Besides his parents, he was predeceased by three brothers, Gary, Wade and Larry Fleury. Calling hours will be Tuesday from 6 until 9 p.m. at the Bruso-Desnoyers Funeral Home in Malone, New York. A Mass of Christian Burial will be celebrated Wednesday morning at 10 a.m. at Our Lady of Fatima Church in Westville with the Rev. Thomas Kornmeyer officiating. Burial will be in St. Francis of Assisi Cemetery in Constable, New York. 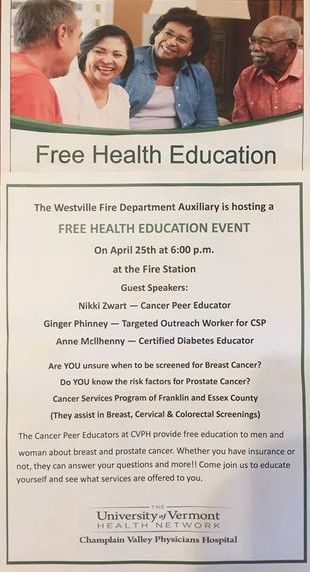 Donations may be made in his memory to the Westville Volunteer Fire and Rescue Department or to the Alice Ballard Fund of Hospice of the North Country Inc. in Malone, New York. Arrangements are through the Bruso-Desnoyers Funeral Service Inc. of Malone, New York. WESTVILLE & BOMBAY -- Coville Bay Apartments currently has two apartments open in the Town of Westville and one apartment in the Town of Bombay. WESTVILLE— Thirteen years have passed since Marie Fleury was killed in her Westville Center home. Her killer has not been caught. On Oct. 20 at 7 p.m. –– three days after the anniversary of her death –– Fleury’s friends and other members of the Westville community will hold their annual neighborhood watch meeting, where Franklin County District Attorney Glenn MacNeill and Senior Investigator Kirk Taylor of the New York State police will provide updates on the unsolved crime. Despite the passage of time, Fleury’s unsolved murder still generates conversation –– and concern –– in the community. “It was a dark day in Westville, the day that Marie Fleury was killed,” Supervisor Rod J. Lauzon said. Fleury was killed at her residence located next to the Elm Circle Diner on the night of Oct. 17, 2002. She was 64 years old and had been a former nurse. Each year since, law enforcement officers investigating the case have come to the annual meeting to update residents on its status. Usually, there is nothing to report, but everyone involved keeps hoping something new will develop. Seventy individual invitations have been sent out, and the meeting is open to anyone in the community. In the past, attendance has remained relative constant at around 40, Lauzon said. A $16,000 reward is being offered to any individual that provides information which leads to the arrest and conviction of the person or persons responsible for Fleury’s death. While the status of the murder investigation tops the meeting’s agenda, community leaders use it as an opportunity to alert residents to more current problems. In past years, law enforcement officers have talked about drug problems in the area and this year, Malone Chief of Police Chris Premo and Franklin County Sheriff Kevin Mulverhill will address issues involving K-2, the synthetic marijuana that is a growing problem statewide, and any other questions residents may have. A Neighborhood Watch Meeting will be held on October 20, 2015 at 7:00 P.M. at the Westville Town Hall, located at 936 County Route 19, Westville NY. October 17th 2015 marks the 13th anniversary of the death of Marie Fleury. Once again, in her memory, the Town will hold its annual Neighborhood Watch Meeting. Franklin County District Attorney Glenn McNeil and Senior Investigator Kirk Taylor of the New York State Police will provide an update on this unsolved crime. Malone Chief of Police Chris Premo and Franklin County Sheriff Kevin Mullverhill will address the issue of K-2, the new synthetic marijuana. Please attend and support our law officers and show our appreciation for all the hard work they do. The Summer Lunch Program is back and in full swing!! 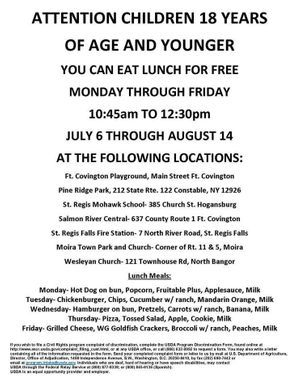 Make sure you take advantage of the free lunches for your children. WESTVILLE— The state Department of Transportation plans to make several improvements to a stretch of state Route 37 that local officials say is dangerous, but the change town officials wanted to see –– the flattening of a small hill –– won’t be among them. Westville officials had submitted a letter to the DOT asking that a hill on Route 37 in the vicinity of Bruso Road be removed. Supervisor Rod Lauzon said that this was a dangerous area where many accidents had occurred, including the 2012 crash that claimed the life of retired New York State Police Investigator Anthony Bailey. The hill is not tall enough to create a line-of-sight problem, but the sudden up-and-down could catch drivers unaware and lead to a loss of control. Lauzon said that if the hill was removed, that stretch of road would be safer. The DOT examined the area and recommended several improvements, but declined to remove the hill. DOT Region 7 spokesman Michael R. Flick noted that a traffic engineering investigation that included a field review as well as a review of the latest three years accident information was conducted in the area. “As a result of the investigation, it was concluded that driveway warning signs in the area of a local deli and fuel supplier would be appropriate,” Flick said. The signs would provide for increased driver awareness to the possibility of slow moving vehicles making turns at these driveways, he said. In addition, Flick said that the DOT will be establishing a no passing zone in the deli/fuel service area to deal with possible slow-moving vehicles and or turning vehicles in this location. WESTVILLE — The north country communities that tried to create a regional municipal power company have received refunds of some of the money they used in trying to bring the project to fruition. The dissolution of the Alliance for Municipal Power has resulted in the communities being refunded a total of $76,131. 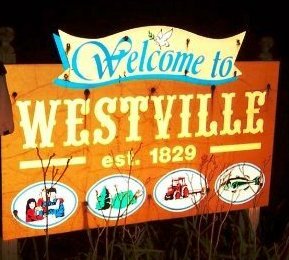 “We never made it,” Westville Supervisor Rod Lauzon said Monday after he distributed a breakdown of the refunds to members of his Town Board. Westville was one of four Franklin County municipalities that joined with 20 St. Lawrence County communities in an effort to bring low-cost electricity to the residents of each participating town and village. The Alliance for Municipal Power was formed in 1996 to create a municipal electric company along the lines of the Massena Electric Department, which was established by the village in 1981. The MED boasts that it has among the highest reliability rates in the nation and its charges are in the lowest 10 percent nationally. In 2010, then-Gov. David Paterson signed a law creating the North Country Power Authority, the public utility that would have operated the regional electric company. But since that time, little was done to advance the project and the NCPA essentially went dormant in 2012 after Gov. Andrew Cuomo failed to appoint enough members to the organization’s board to form a quorum. “None of it came together and it was like a golden egg that never hatched,” said Moira Supervisor Cindy Gale, who with Russell Town Supervisor Robert Best was among the leading proponents of the AMP. The bankruptcy of the Howrey law firm, which had been retained to help launch the power authority, also was a key element in the NCPA’s demise, Best said Monday. The law firm, which had offices in Washington, D.C., and New York City, dissolved amid financial woes in March of 2011 after submitting a bill for its services for $3.2 million to the AMP, Best said. The alliance refused to pay because the law firm failed to provide a detailed bill of the charges, he said. Had the towns been forced to pay the bill, they would have been bankrupted themselves, Best said. The remaining AMP funds were distributed to the member communities based on their respective populations, Lauzon said. The dissolution resulted in a refund of $1,972.56 for Westville, whose 1,823 residents represent 2.59 percent of the total population that would have been served by the electric company, according to the information distributed to the Town Board Monday night. Other Franklin County towns receiving refunds are Bombay - $1,289.79; Fort Covington - $1,779.96; and Moira - $3,091.40. Best’s town of Russell received $1,948.76. Lauzon, Gale and Best all said they were saddened that the efforts of nearly two decades failed to create a way for residents of their communities to save on their electric bills. Gale said she felt particularly sorry for Best, who had been the driving force behind the project and put many years into trying to make a reality. But Best said he has put the effort behind him. “It was long enough (ago) that it feels like ancient history to me,” he said.